The Wisdom Ball is a ball with 6 large circular caps which just touch each other at their edges. 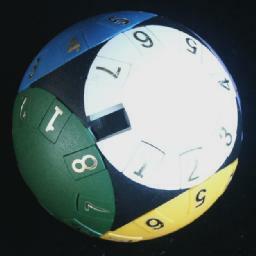 Each cap has a unique colour, can rotate, and has eight numbered pieces along the edge. The white cap has a gap instead of piece number 8, which allows the pieces to slide from one cap to another, and get mixed. The aim is of course to place the pieces so that each cap has pieces of the same colour in numerical order in the same orientation. The Wisdom Ball has also been marketed under the name Mind Twister. 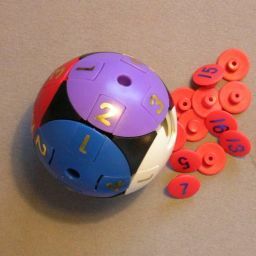 There is a version called the Wisdom Ball II, pictured above right, which has four pieces in each cap instead of eight. This does not really make it any easier to solve. It also has a set of numbered pins which can be stuck in the centre of each cap, allowing you to set other challenges. The Wisdom Ball was invented and patented by Yang Ju-Hsun from Taiwan on 1 June 1993, US 5,215,305. There are 6×8=48 pieces including the gap, which can be arranged in 48! ways. Each piece can be oriented in two ways. This gives at most 48!·247 = 1,747,103,301,148,570,216,747,266,984,449,397,243,628,503,829,271,387,695,301,819,105,280,000,000,000 = 1.7·1075 positions. All these positions are attainable. If you slide a piece from one cap to the next, the gap moves in the opposite direction. To slide a piece from one cap to the next, the gap must first be placed in the destination cap. If you want to move a piece a fair distance, it is sometimes useful to manoeuvre the gap to a position next to the piece in the same cap. Whichever way you then want to move the piece, the gap is close at hand. Each time a piece slides from one cap to another, it is turned upside down (relative to the cap it is in). If you want to move a piece from cap A to adjacent cap B without it turning over it must be slid twice, and therefore it must first be slid to a cap that is adjacent to both A and B. Phase 1: Solve four caps. Find the white cap (the cap that when solved will contain the gap), and choose one of the adjacent caps. Using the techniques described above, solve the other four caps one by one, leaving only the white cap and an adjacent one unsolved. Phase 2: Put the pieces in the correct caps. On the unsolved cap without the gap, find a piece that has the wrong colour. Slide this piece to the cap with the gap. Repeat a-b till all the pieces are in the caps of the same colour. Phase 3: Orient the pieces correctly. Let A be the piece you want to flip. Let B be any piece on the other unsolved cap, and let C be any piece on the cap adjacent to the two unsolved ones. Slide the pieces in the following order: C A B A C, and then place pieces A and B in their correct caps. Repeat step a until all pieces are correctly oriented. Phase 4: Put the pieces in the correct order. To swap the gap and piece C on the white cap and pieces A and B on the other cap, you slide the pieces in this order: B C A B C A. This is easy to remember since at each point there is actually only one possible move using one of the three pieces involved. To swap pieces C and D on the white cap and pieces A and B on the other cap, simply slide the pieces in the following order: B C A D C A D B. Again there is actually only one possible move at each step. Repeat steps a and b until nearly all the pieces are in the correct position. You may however be left with a position where a single swap is needed. A parity problem has occurred when you are left with a position needing a single swap to solve. This means that actually all the pieces of one of the caps need to be placed one step further. If 1 to 7 are the pieces on the white cap, and A and B are pieces on an adjacent cap, then the move sequence A 1 B 2 1 3 2 4 3 5 4 6 5 A 6 B will perform a single swap in the white cap and not move anything else. After doing this, return to steps a-b to solve it.